I’m always excited when someone asks me a research question that takes me deep into the archives. I love any excuse to spend a few hours carefully turning the pages of The Hub and The Carriage Monthly. The articles are gold mines of information, and I never fail to learn something new. But the pages before and after the articles might be my favorite part. I love looking at old advertisements – reading the claims made by competing companies, questioning the way they boast, finding accessories I’ve never seen before and wondering exactly how they work. These ads can often teach us a lot. Valentine & Company was a frequent advertiser in The Hub. This particular ad was published on September 1, 1877 (Vol. 19, No. 6). 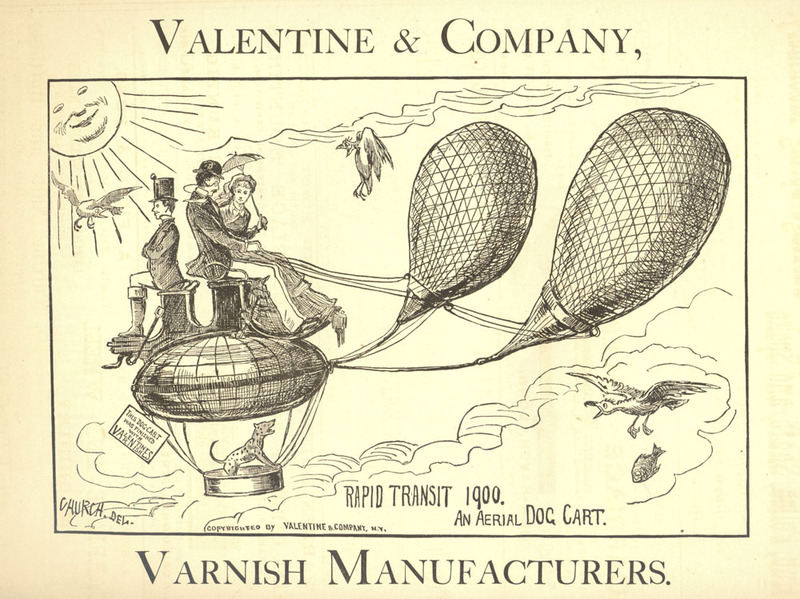 Looking through Valentine advertisements and catalogs, I’ve noticed that carriage word-play was a common theme throughout their marketing materials. We’ll be sharing more of their entertaining prints in future posts! Stimson & Valentine was formed in 1832 as a merger of a paint dealership and a commercial varnish producer. Around 1860, Valentine brothers Lawson and Henry became sole partners in the business and renamed it Valentine & Company. They soon made the decision to hire a chemist, Charles Homer, who worked to perfect their product. Valentine & Company relocated to New York City in 1870, and began specializing in varnishes for vehicle finishing. By the turn of the century, Valentine & Company had branch offices throughout the country, and had won dozens of international medals for its high-quality varnish. L. Valentine Pulsifer joined the company in 1903, putting his Harvard University chemistry degree to work. In 1907, Pulsifer produced a new product called Valspar, the first clear varnish. In 1932, Valentine & Company began to operate as a subsidiary of the newly formed Valspar Corporation, which is still in business today.